LEAVE NO TRACE, is the latest haunting film from Debra Granik (the Academy Award®-nominated Winter’s Bone, Stray Dog, Down To The Bone), a moody, mysterious and mesmerizing exploration of an unexpected existence on the edge. 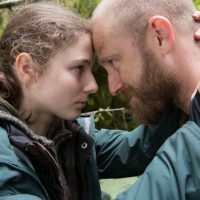 A teenage girl (breakout newcomer Thomasin Harcourt McKenzie) and her father (Ben Foster) have lived undetected for years in Forest Park, a vast woods on the edge of Portland, Oregon. A chance encounter leads to their discovery and removal from the park and into the charge of a social service agency. They try to adapt to their new surroundings, until a sudden decision sets them on a perilous journey into the wilderness seeking complete independence and forcing them to confront their conflicting desire to be part of a community and fierce need to live apart. Based on the novel “My Abandonment” by Peter Rock.